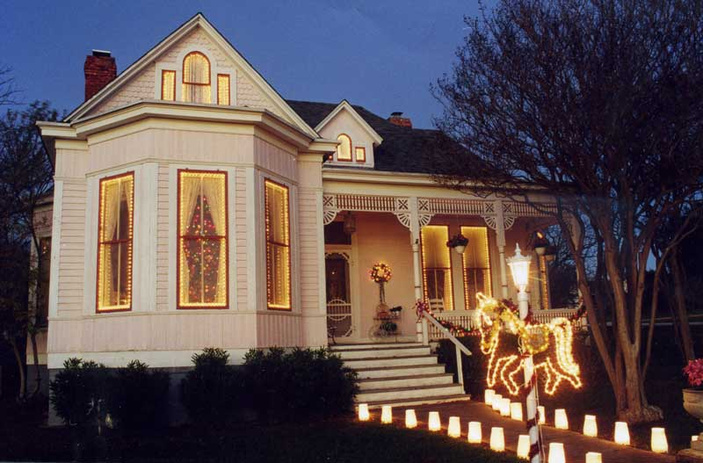 MARBLE FALLS — A beautiful Marble Falls Victorian home is celebrating its 125th year with a Christmas experience, and you’re invited. The Falls on the Colorado Museum is hosting the annual Victorian Christmas Open House on Saturday, Dec. 2, at the historic Christian-Matern home, 603 Seventh St. at Avenue F. Homeowner Caryl Calsyn will be on hand to talk with visitors as they tour this important part of Marble Falls history. The open house is 6-8:30 p.m. The house was built in 1892. With encouragement from the late Madolyn Frasier, Calsyn applied for and received a Texas historical marker in 1997. As stated on the marker, the late Victorian structure shows Queen Anne-style influences with decorative woodwork and protruding bay windows. Victorian decorations for the Christmas season include a 12-foot Christmas tree in the front bay window, a lighted gingerbread candy shop in the kitchen, a Victrola in a bedroom, and more. The house was built for George Christian and his wife, Juliet. Christian was one of 10 owners of the Texas Mining and Improvement Co. that developed Marble Falls. Juliet was the daughter of the town’s founder, Adam Rankin Johnson. George and Juliet Christian married in 1887. Ivo B. and Mina Matern purchased the house in 1908 and owned it for 51 years. Matern was a merchant and rancher who served as mayor of Marble Falls in 1937. Other house owners followed until Calsyn purchased the property in 1992 and started restoring it. Museum board members will assist Calsyn in welcoming visitors and setting the dining room table with holiday refreshments. Admission to the come-and-go open house is free. However, donations to the Falls on the Colorado Museum are welcome. For more information about the event, call Calsyn at (830) 693-4791. The museum is located at 2001 Broadway St. in Marble Falls. Go to fallsmuseum.org for more.